Happy Pancake Day! Or maybe you know it as Shrove Tuesday, Mardi Gras or Carnival. It’s also the day before Lent for Christian denominations that observe it. We’re not from a Christian tradition that specifically observe Lent, but when I heard about Pancake Day a few years ago it just sounded like a fun “holiday” to do with the kids. We love pancakes around here, and it sounded fun to eat pancakes on a day when, apparently, many, many other people are doing the same! The tradition of eating pancakes the day before the start of Lent dates back centuries. In times past, women wanted to use up fats and other rich foods that would be abstained from during lent, and pancakes were a tasty way to do this. In England, children would run from house to house singing a little song about the shrovetide, and demanding bits of food — pancakes, donuts or other rich foods, depending on the local custom. More recently, a custom of “pancake races” has developed that involves running while flipping a pancake in a skillet. 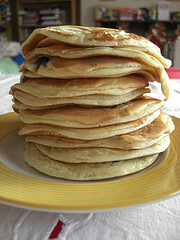 Today we’ll be eating pancakes for lunch and talking about Pancake Day and other similar observances around the world! After a quiet Thanksgiving at home, we enjoyed plenty of fun family time last weekend playing games, doing crafts, watching movies and a local Christmas parade on TV, and getting a bit more decorating done. We also took the kids to an indoor play area (but I was too busy keeping track of them to take any pictures!). 1. Without really planning on it, we finished a lot of math lessons this week for both Miss M and Mr E. Mr. E completed lessons 55-60 and started lesson 61 in Right Start B (though we skipped the midterm test — no need for a test for a Kindergartener). We worked on telling time, adding coins, adding 9 by completing the 10, and he played his first game of corners. The Corners game was definitely the highlight. Unless something very surprising happens, we’ll finish B before the end of the year. I’m not sure exactly what we’ll do after that — maybe some Singapore or Life of Fred? Just play games? I just don’t think I want to start level C with a K’er! 2. Miss M worked on pages from early in the RightStart D workbook that she could work through on her own as review, plus we went through about 8 lessons together from the middle-ish portion of the book (starting with lesson 47, ending with lesson 68, and skipping a bunch in between). We did some really interesting stuff, like learning about check numbers and “Terry’s Method” of subtraction. We also got to assemble those “thousands cubes” to start talking about numbers in the ten thousands up to the millions. Even the lessons we are covering together are pretty easy for Miss M so far (yea for easy math! ), hence why we are able to cover so many lessons without a lot of effort. We’ll start the section of Level D that’s all new in a week or two (but I’ll still be having her go back and do earlier pages for review and practice). Now I’m starting to think that we may finish level D as well before the end of the year unless I significantly slow things down. But I am not going to really “worry” about that at this point!!! History: We’ve “officially” moved on from the Revolutionary War in our American History studies and started studying the “new nation” period — with reading lots of living books it’s hard to keep things in a precise order, so I am considering events including the writing of the Constitution, the Louisiana Purchase and the War of 1812 to be all topics that are fair game right now! Science: Once again, no other science other than what Miss M is doing independently with Sassafras Science Adventures. I think I’ll make it one of my New Year’s resolutions to get back on track with doing more science study as a family. 3. Mr K randomly found a fun CD at the library: Kids Meet Composers by Wendy Rollin. Kids are introduced to 10 composers with a short track giving a brief bio of each composer, plus a famous tune from each composer set to new words that again teach something about the composer and his/her music. The kids all enjoyed listening to the CD and dancing or marching around the living room! 4-6: I started pulling out our fun Christmas “stuff” this week. The kids enjoyed spending a few afternoons making Christmas crafts, using the Christmas play-doh set, and playing with the Playmobil Nativity set. I know there are lots, and lots of random holidays out there. But Pi Day might be one of my most favorite! Pi day is March 14th. (Get it? 3-14?). The past few years we have celebrated Pi day just by eating pie. I serve something pie-like for dinner (like taco pie, shepherd’s pie, or a spinach pie…pizza would work too! ), and, of course, a sweet pie for dessert. This year we’re going to incorporate it into our homeschool day. While we have done some nifty geometry lessons with RightStart math level C, we haven’t done anything with circles yet. So one of the first things we’ll do is talk about measurement terms for circles (radius, diameter and circumference). Then we’ll try a “finding pi” activity. I thought this lesson plan did a nice job of explaining how it might be done. Even though the grade level listed is significantly higher than that of my kids, I think at least Miss M will be able to “get it.” Mathisfun.com had another interesting “finding pi” activity, but I think we might save that one for another year. I have requested a few Pi-themed books from the library. I don’t know if I made my requests in time, but I am especially hoping that “Sir Cumference and the Dragon of Pi” arrives on the reserve shelf by Wednesday. Since my kids love crafts, we might need to make some circular or pi-themed crafts. 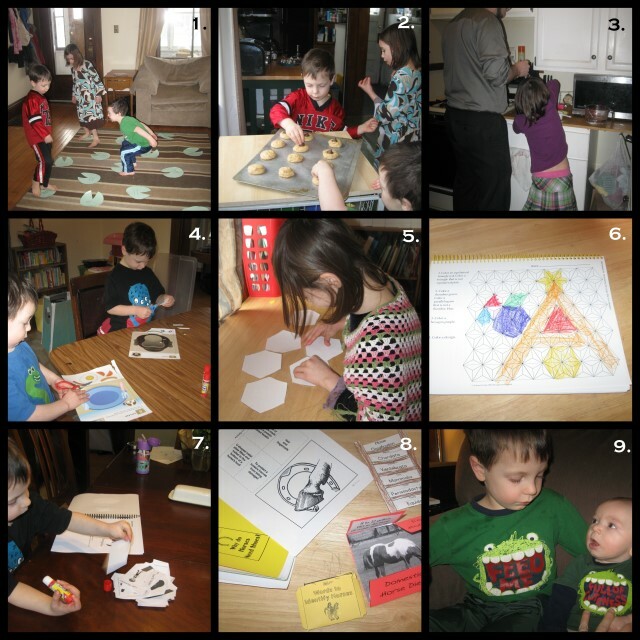 I like the suggestions at Helping Little Hands, which includes some paper plate crafts and a pi-themed patterning worksheet! I think we’ll also talk just a bit about the history of Pi. Check out this page from the organization that founded pi day for a quick read on the history of Pi. 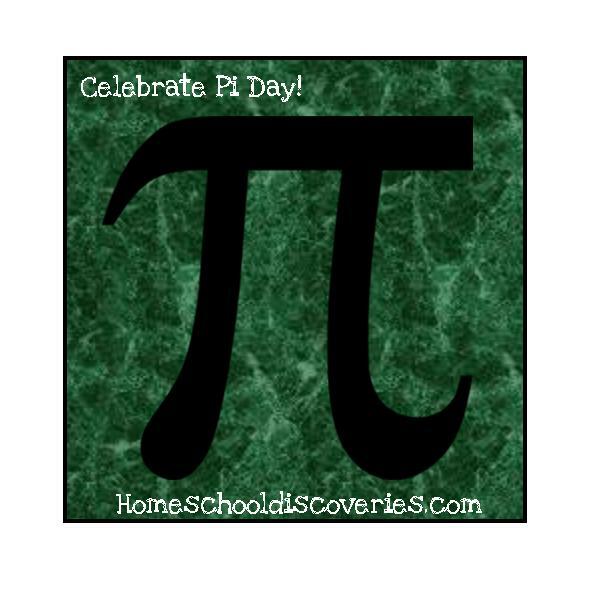 If your are looking for even more amazing Pi Day ideas, check out my Pi Day board on Pinterest! Are you going to celebrate Pi Day this year? Do you have any other fun Pi Day ideas? 1. We celebrated Leap Day with a “fun school” day. Despite my previous aspirations, we did not do a 100 days celebration as well. 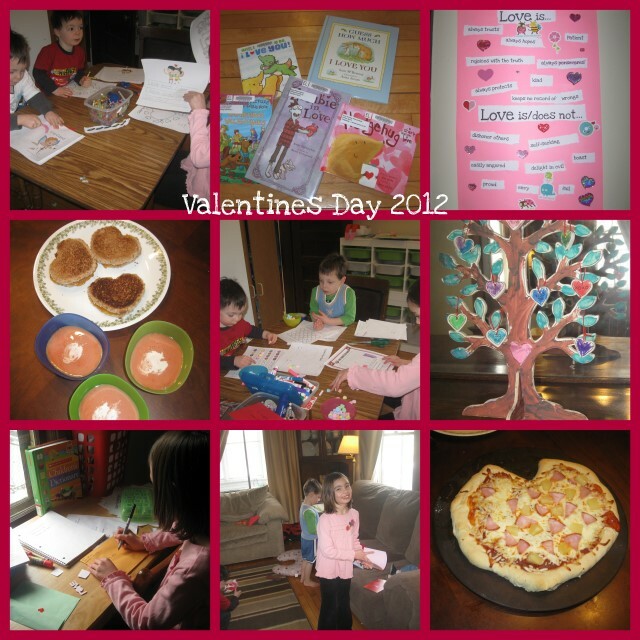 Between the amount of time I was able to find to prepare, and remembering how busy our fun school Valentines day was, I decided we would shelve the 100 days celebration for this year and plan for it next year (since we will, of course, have to wait another four years to celebrate Leap Day!). In the picture, the kids are playing leaping lilly pad games inspired by this post at Toddler Approved. 2. Also inspired by Toddler Approved, we read Frog and Toad stories on Leap Day — including the story about cookies and willpower. Then of course we had to make some cookies. Peanut Butter kiss cookies are a favorite here…and who says they are only a Christmas cookie? Not us! It was fun to talk about willpower and if there is any difference between willpower and self-control. (The kids said “no” initially, but I tried to make the case that willpower is something of our own effort, while self-control is a fruit of the Spirit). 3. Miss M helped daddy to make our second-ever batch of homemade rootbeer! I jumped the gun on opening the first 2 liter of homemade rootbeer, and it was not very fizzy. We’ll open batch number two tonight! 4. While getting out some science and geography worksheets for Miss M (she really likes these, and she is probably learning at least a little bit from them), I remembered I had a Kumon cutting and pasting book for the boys we hadn’t gotten out at all this school year. 5. and 6. With completion of lesson 81 on Tessellations, Miss M has made it through the big section of geometry/drawing lessons in the middle of RightStart C. We had a review day yesterday and a games day today. Miss M was not pleased to hear that we are back to “regular” lessons after this involving mostly adding, subtracting and multiplying. She really likes the drawing and geometry! 8. Miss M has her own cutting and pasting project — she is working on the Horse lapbook from Hands of a Child. She has chosen horses as the subject for her “Expert Day” project for our homeschool co-op. More on expert day in coming weeks! 9. Aren’t Baby J and Mr. E cute in their almost-matching shirts? One was a hand-me-down and one was from the thrift store — they have the same picture but different words! It’s not the best picture of the two of them, but every picture I tried to take where the boys were looking at me, Baby J’s hands were blocking his shirt! Baby J turned 4 months old this week and is now 15lbs and 12 oz! 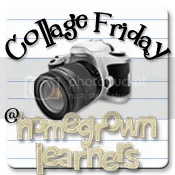 Collage Friday @ Homegrown Learners and the Weekly Wrap-Up @ Weird, Unsocialized Homeschoolers!